There’s a very strong economic argument for Brexit which is partly based on an independent United Kingdom having more leeway to adopt pro-market policies. 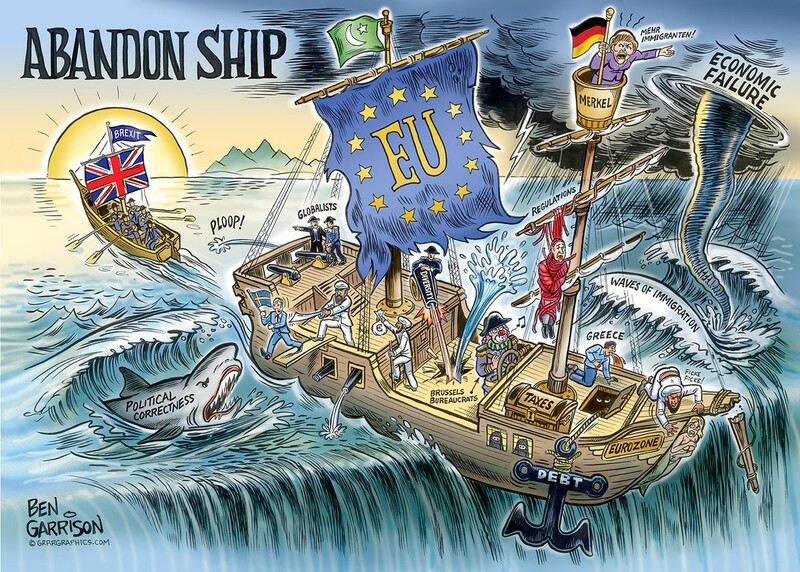 This case for Brexit is also based – indeed, primarily based – on the fact that the European Union is a slowly sinking ship thanks to horrible demographics and economic weakness. I think the Brits made the right choice (assuming Prime Minister May doesn’t sabotage the process) in voting to get in a lifeboat. By the way, the chronic stagnation in Europe is largely the fault of member nations. For instance, I don’t blame the euro (the common currency used in 19 nations) or the European Commission (the easy-to-mock Brussels-based bureaucracy of the EU) for the bad policies adopted in nations such as France, Italy, and Greece. That being said, the European Commission and its political supporters want the power to make things worse. Actually, they want two powers to make things worse. The first bad idea, generally supported by the French and Germans, is to give Brussels direct fiscal powers. This almost certainly would mean E.U.-wide taxes imposed by Brussels, presumably accompanied by expanded levels of intra-E.U. redistribution. The second bad idea, also supported by France and Germany, would be E.U.-wide rules to force national governments to adopt bad policy. This almost certainly would mean greater levels of tax harmonization, presumably accompanied by mandates to expand the welfare state. I’ve written before about the first bad idea, so let’s focus today on the threat of Brussels-mandated tax harmonization. The main obstacle to this bad idea is a “unanimity rule” that basically prevents further centralization of tax policy unless every member nation concurs. This rule is what saved the E.U. from prior attempts to force member nations to adopt anti-growth policy. …efforts to create a tax cartel have a long history, beginning even before Reagan and Thatcher lowered tax rates and triggered the modern era of tax competition. The European Commission originally wanted to require a minimum corporate tax rate of 45 percent. And as recently as 1992, there was an effort to require a minimum corporate tax rate of 30 percent. But the bureaucrats in Brussels have not given up. Politico reports on the latest effort to weaken fiscal sovereignty. The European Commission…is set to unveil a communication…that will call on the bloc’s leaders to consider moving to qualified majority voting in EU taxation policy. That system would allow a tax initiative to become EU law as long as 16 out of the 28 countries agree on it. Any tax-related decision currently requires unanimity, leaving many tax proposals doomed to fail. The tax veto has undermined the bloc’s policy ambitions…the…veto…has left several tax files gathering dust on Brussels’ shelves, like the financial transactions tax, which the Commission first proposed in 2011. …The communication is set to suggest introducing qualified majority “step-by-step” for tax… The French commissioner discussed the plan over a lunch with EU ambassadors… “Ireland, Malta, Sweden and Cyprus were against it,” one diplomat that received a debrief on the meeting said. “The rest were cautious and few were for it.” France, Spain, Italy and Portugal were among the few that spoke in favor of the plan. …The Commission is determined to make its case. …The tax veto has…deprived national coffers of billions of euros, according to the draft communication… The digital and financial transaction taxes alone would have generated over €60 billion a year in revenue, the document says. I do give the European Commission credit for honesty. The bureaucrats are openly stating they want to get rid of the unanimity rule so that politicians in 16 member nations can force all 28 member nations to have high taxes. You may be wondering, incidentally, why the European Commission, and the pro-tax governments like France want one-size-fits-all rules for the European Union? Why not have a let-a-thousand-flowers-bloom approach so that all 28 nations to make their own choices? Once again, they are brutally honest. They unabashedly state that they want harmonized rules so they can eliminate tax competition (the left fears a “race to the bottom“). Speaking of which, the bottom line is that Europe will decay and decline much faster if the European Commission is successful in its latest effort to kill the unanimity requirement. The last thing the E.U. needs is more taxes and higher spending. P.S. There already are rules for harmonized VAT taxation in Europe, which predictably has enabled ever-higher tax rates. P.P.S. The European Commission even tries to brainwash children into supporting higher taxes. Andrew, completely agree. This is similar to capitalism. With capitalism, people are free to try new things, then quickly reject those which don’t work, then try yet other new things. The genius of capitalism isn’t an absence of mistakes, but the freedom to flexibly adapt and change. When government slows, stops, or distorts flexibility and adaptation, the result is less prosperity. The great advantage of devolution is not that you will always make good policy, it’s that if you make bad policy then it is easier and quicker to reverse. And you can do so without having to hire lobbyists to go to Brussels to get the same bad laws simultaneously reversed in 27 other territories. So one way to accelerate the EU’s decline is to let them get what they think they want? Correct?